Transportation agencies here are deploying a few tools to help keep people moving. Still, the region can't absorb the viaduct's 90,000 daily vehicle trips and 30,000 detoured bus riders without traffic jams that likely will ripple out as far as Woodinville or Auburn. 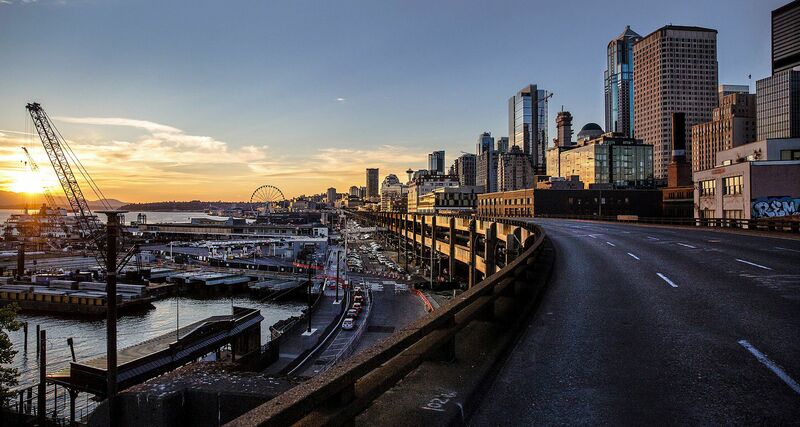 The Alaskan Way Viaduct will close forever Friday night, Jan. 11. Travelers must deal with three weeks of no Highway 99 through downtown Seattle, until a new four-lane tunnel between Sodo and South Lake Union opens. Seattle will follow cities from San Francisco to Seoul that removed their noisy elevated highways, to reduce earthquake risk, create park lands or restore scenic views. The $3.3 billion project includes a downtown tunnel, ramps, surface streets and waterfront promenades. As for car and bus travel, the new alignment will complicate trips to or from Interbay and Magnolia, while its larger Sodo interchange makes other drives easier, such as Burien to stadiums, or from state ferries to the airport. But first, road users will endure the longest highway closure in Seattle history, until the tunnel opening aimed at Monday, Feb. 4. “We have to be compassionate with each other, and compassionate with ourselves,” said Heather Marx, the city’s downtown mobility director. Wake up earlier, rearrange work shifts, or at least take a deep breath, she suggests. In Los Angeles, drivers can detour into a quilt of freeways during construction closures, while Atlantans switched to freeways circling the city after its downtown Interstate 85 collapsed in a 2017 fire. But in Seattle all roads must cross the Ship Canal, Lake Washington or the Duwamish River. There aren’t many alternatives if a toppled truck blocks a highway, like the semi that spilled frozen fish over southbound Highway 99 in 2015, closing it for nine hours and paralyzing the city. Transportation agencies here are deploying a few tools — extra buses, added police and incident-response trucks, more limits on construction that blocks traffic lanes, and pleas for more telecommuting — to help keep people moving. Still, the region can’t absorb the viaduct’s 90,000 daily vehicle trips and 30,000 detoured bus riders without traffic jams that likely will ripple out from Sodo as far as Woodinville or Auburn. Congestion will begin an hour early, so 5:30 a.m. will be the new 6:30 a.m. during the highway closure, say traffic experts and the data from past closures. The region’s rapid growth, though, may hinder our ability to adjust, beyond simply staying home. Outlying residents, who face Interstate 5 stop-and-go traffic by 5:30 a.m. in Federal Way, have the least flexibility, while Seattle streets such as Spokane Street and Second Avenue don’t fill until 7 a.m., said University of Washington professor Mark Hallenbeck, director of the Washington State Transportation Center. “Some of the streets can definitely take more early traffic, as can the bus routes,” he said. We think congestion depends on lane space, but equally crucial is the human tolerance for misery. When traffic jams get extreme enough, drivers bail out of the lineup, or cancel a trip. Major I-5 lane closures in August 2007, to replace old expansion joints in Sodo, were forecast to cause weekday backups of 10 to 30 miles. But actual congestion extended just three miles longer than normal along Beacon Hill, adding roughly an hour’s delay. About 50,000 daily trips simply evaporated. Viaduct shutdowns in 2011 and 2016, nine days each, caused few problems the first weekday morning, but congestion later returned. Bus trips south of downtown averaged about 12 minutes longer and car trips 20 minutes, but traffic conditions sometimes turned worse because of incidents such as crashes, water-taxi breakdowns, or freight trains crossing. King County’s population has increased by 85,000 from 2016-18, and unlike past closures, this one also will reduce Aurora Avenue North, near Mercer Street, to one lane each direction. Dennis Millard is bracing for day shifts to become night shifts. He drives a tanker truck from Harbor Island to Fishermen’s Terminal for Ballard Oil, which has been filling its 40,000-gallon reserve tank next to Salmon Bay with marine diesel, ahead of January orders when the Alaska pollock fishing fleet heads north. The company also provides home-heating oil, and topped off backyard tanks in December for those customers to avoid crosstown deliveries through the expected January traffic mess. Since 2011, Highway 99 has been reduced from three lanes to two in each direction, where a temporary road curves around construction at the new tunnel’s Sodo portal. Millard, a 52-year-old Ballard native, usually takes the viaduct anyway, but by 2:30 p.m. it’s clogged enough he opts for surface Alaskan Way. “On a good day 15 years ago, I could get 10 loads in 10 hours,” Millard said, grappling the shift knob of a dusty red Kenworth truck. “Now I get half that, four loads in eight hours. The pending switch to the waterfront route full time will place him amid ferry and stadium traffic more often. “It’s just frustrating, you go light-to-light-to-light,” he said. Millard thinks Seattle needs three west-side routes: the tunnel, the viaduct and a truck-worthy surface road. “There’s too much head count, too many cars, for the roadways we have,” he said. At a northbound Aurora-Denny transit station, bus riders said they’re ready to go with the flow. “I don’t mind, if it’s still under 45 minutes or an hour,” said Henry Yu of Shoreline, standing in the aisle of an E Line RapidRide bus. Mary-Kylie Crawford of Greenwood said she’ll gather her Jane Austen audio books, anticipating her 25-minute ride will grow to 40 minutes. “I’ll probably get through them faster,” she said. Crawford resolved to walk the 5 miles once a week. Rahul Ghai, waiting for a Route 28 bus to Ballard, said if Aurora gets clogged he might shift to Route 40 over the Fremont Bridge. However, the 40 is already overloaded and slow. Commuters over the years have knocked the drive-alone rate to one-fourth among downtown workers, so the usual admonitions of “don’t drive” may be squeezing juice from a dry orange. But what happens to the two-thirds majority throughout King County who do drive alone to jobs? WSDOT no longer predicts travel times, but did emphasize the 20-minute delays on other highways during previous Highway 99 closures. That’s an average, and there are many cases of 45-minute slowdowns during weekend repair jobs. During the May 2016 nine-day viaduct closure, weekday-morning trips from Federal Way to Seattle on I-5 averaged 75 minutes, a 15-minute increase. INRIX records show Interstate 405 speeds at Renton sank to 19 mph at morning peak and failed to exceed 30 mph midday. First Avenue South next to the viaduct crawled at 7 mph, and Fourth Avenue South at 10 mph. Even trips from Bellevue on Interstate 90 slowed by 15 minutes, because arriving motorists reached a wall of downtown Seattle traffic. One finding was surprising — Aurora Bridge flowed normally at 41 mph, as volumes plunged. “You don’t have as many destinations served by the Aurora Bridge, as when the viaduct is open,” said Trevor Reed, INRIX transportation analyst. Certain pockets like Renton can’t get worse — a phenomenon Reed calls facility breakdown. Once speeds fall below 45 mph, each additional vehicle causes more braking, until a minimum flow of 15 mph on average, he said. “You can’t break what’s already broken, unless you throw it into park,” he said. The realignment kicks off a so-called “period of maximum constraint,” as viaduct removal, a convention-center expansion, renovation of Seattle Center’s arena for pro hockey, and private tower projects clog streets, with minimal relief until 2023 when light rail connects to the Eastside. “When we’re done with it all, it’s going to be totally worth it,” Mayor Durkan said. She insisted since last year’s campaign that traffic snarls are “not going to be the mayor’s fault.” But this December she also called the worsening congestion an opportunity to change our travel patterns. Considering how little extra capacity is available in most locations, merely arriving at work or delivering supplies in mid-January may be enough of an achievement.